Claire Devereux is forced to fight for her life when the past she tried to hide catches up to her the summer after high school graduation. “Chance” is the first in a four-book series by self-published author and Laurel resident Monica Pitts-Lack. Lack, an employee of South Central Regional Medical Center, was interested in creative writing in grade school and college. After writing a children’s book for a class assignment at The University of Southern Mississippi, Lack’s professor encouraged her to look into getting published. “Chance” appeals to adult audiences who enjoy crime, mystery and suspense novels, Lack said. Lack wanted readers to get into the story and feel the emotions. While writing “Chance,” Lack had to do her research on everything from Baltimore to guns. Lack began writing “Chance” over the summer and it was published and released on Amazon as an eBook on Nov. 27. “Chance” is now available in paperback at Amazon and Barnes and Noble. The cover of Lack’s second book in the series, “Crossroads,” was recently unveiled and the novel is expected to release next year. *This article was written by myself, Jennifer Lowe, and published in the Saturday, Dec. 22 issue of the Laurel Leader-Call. It’s December – the time of year when most everyone is watching Christmas movies, putting up decorations and shopping for gifts. Therefore, it’s only fitting that my first blog entry be a short Christmas story. It’s so easy to fall into the hustle of shopping and decorating and forget what’s important. This short story is about Marie, a lawyer who has put her job ahead of everyone she ever cared about. It takes a little girl who is abused and desperately seeking God to bring Marie back around to see what’s ultimately important in life. Remember, Christ is the reason for the season. Marie bolted out of the front door of her apartment with one shoe on her foot and the other in her hand. After being up all night working on a child abuse case, Marie was running late for work. She managed to walk and slip her heel on at once, grabbed a cup of coffee from Starbucks and walked to the office. Marie quickly glanced at the town tree that was on display in the center of the small city park. Was that up yesterday? The town Christmas tree was a miraculous display that put everyone in the Christmas spirit. 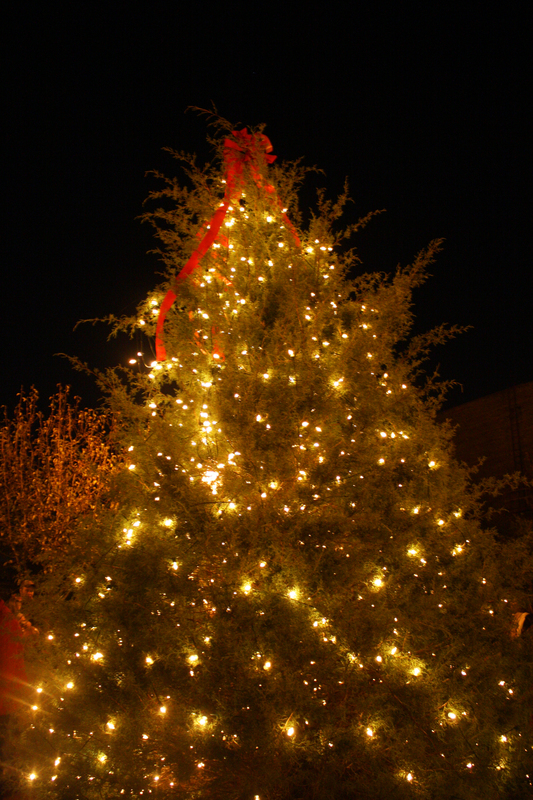 The 30-foot tree was decorated with clear lights and an assortment of red and green ornaments. During the holidays, Marie passed the tree each morning on her way to work. As a kid, her family celebrated Christmas like it was the only holiday of the year. Christmas music played as her family opened gifts in the morning and read the story of Jesus’ birth. The house was brightly lit on the outside and the inside was elaborately decorated with mistletoe, garland, Christmas figurines and, of course, a live tree topped with an angel. However, as Marie grew up and left for college, she grew apart from her family. Achieving goals took time and dedication and there simply wasn’t much time to visit her family in Washington, let alone spend a week for Christmas. Little by little, her Christmases at her parents’ grew from slim to none. When Marie took her first job fresh out of law school, she often worked straight through the holidays when no one else would. It bothered her at first, but she eventually got used to it. The extra cash didn’t hurt, either. The following day, Marie noticed a young girl of about six standing beside the tree and staring up at it. The girl had her light brown hair pulled into a messy ponytail and her clothing was tattered and aged. For the next few days, Marie noticed the girl either standing or sitting in front of the tree just watching it. It was always the same thing. The week ended and another began and the little girl still sat by the tree. Marie was curious who the little girl was and why she was so fascinated by the tree. Did she not have one at her home, or was it simply that pretty? “How can she keep her safe when she looks like she’s six years old?” Marie was furious. She had seen too many abuse cases to sit back and let this girl die because her dad beat her. Marie sighed and turned to walk away. At lunch, Marie knocked on her boss’ door. Don was a good boss, especially to Marie. Even her boss was guilty of telling her to take a vacation. She hadn’t taken vacation time in years. Marie smiled and thanked him. When four o’clock rolled around, Marie was out the door. She walked down the busy street and into the bookstore. Once inside, she headed straight for the Bibles. The Corner Bookstore was locally owned, so there was a huge selection of Bibles and study books. After a few minutes searching, Marie came across a small, pink children’s Bible. The leather was decorated with multi-colored flowers. There was also a children’s study inside. “Perfect,” Marie smiled and took the Bible to the checkout. The cashier gift-wrapped it in shiny red paper with a small silver bow. Marie thanked the cashier and walked back out to the town tree, but was surprised to see the little girl wasn’t there. Marie placed the box under the tree in front of the place the little girl sat each day. She was nervous about leaving it because someone could take it, but she felt confident it would reach the little girl. “God, please make sure she gets this,” Marie whispered, looking up to the sky. The following morning, Marie beat the alarm clock. She didn’t have to be at work until nine, but she was up at seven o’clock, dressed by seven thirty and out the door before eight. When Marie reached the tree, her face fell. The box was in the same place she left it. Marie walked over to the tree, leaned down and picked the little box off the ground. Maybe the little girl didn’t make it back over or something. She decided to set the box back down, but checked inside to make sure the gift hadn’t been taken. The gift had been taken and was replaced by a letter. Written in childlike handwriting, only one sentence was on the sheet of paper. Marie put her hand over her heart, touched that this little girl was kind enough to write a thank you letter. Tears rolled down Marie’s cheeks. For the first time in a long time, Marie was full of hope, joy and completely in awe of God. Still smiling, Marie took the box with her into the office. When she sat at her desk, she picked up the copy of the daily paper and began to read. The headline took Marie by surprise. Marie’s heart fell to her feet and her eyes blurred. “Local girl beaten to death by father” the headline read. Next to the article was a photo of beautiful, kind little Grace. Marie didn’t have to read the copy to know what happened because the headline said it all. Grace’s father beat her to death last night, probably not long after she received Marie’s gift. Marie knew the editor of the newspaper well and knew the deadline was at ten o’clock each night. How could that have happened only a few hours after she dropped that gift off? Suddenly, the gift didn’t seem like enough. Yes, it was a Bible, but she could’ve helped that little girl. She could’ve gotten her shelter. Where was God in this? “She wants to be with her mom.” Erica’s words played over in Marie’s mind. She scanned the article until she found what she was looking for. Grace’s mother, Sarah, was also beaten last night and was taken to the hospital. According to the article, she was going to be fine. But it was too late for Grace. After reading further into the article, Marie saw a quote from Grace’s aunt. Marie laid her head on her desk and, for the first time since college, she prayed. At first, she was angry. She asked God why He took little Grace so young. Before she gave up hope, a still, small voice from her childhood spoke to her. Isaiah 55:8. The verse was instilled in Marie’s memory from attending church as a child. God had his plans and they differed from Marie’s. They differed from Grace’s. In the end, God did what was best, and maybe removing Grace from her earthly home was the best for her. Marie bowed her head and thanked God for Grace, even if she was only here a short while. She prayed that Grace’s mother would get help when she was released from the hospital, and she prayed that justice would be served to Grace’s father and that he would find healing in Christ, as well. More importantly, she thanked God for opening her eyes to the spiritual needs of Grace and even to herself. Then and there, Marie realized that God and family were far more important than her job would ever be. Marie nor her family was promised tomorrow. Marie loved her job and saving abused children was important, but so was her family. Marie couldn’t wait to spend Christmas with her family.